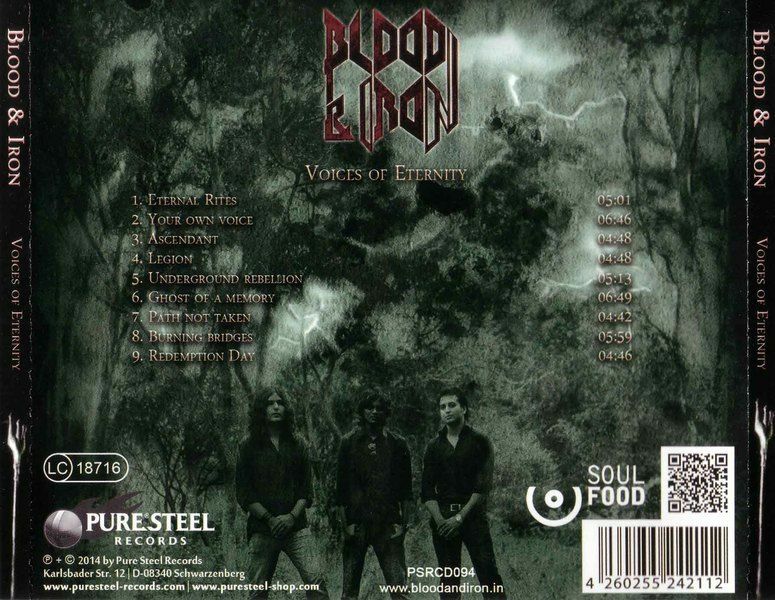 Blood & Iron was formed in early 2005 by Ashish, while originally veering towards symphonic heavy metal, the band has evolved to a purer old school heavy metal sound. After numerous line-up changes, for about a year and a half, the band stabilized – and since then there’s been no looking back.The first two albums met with good reviews and success on the Indian underground metal scene. Further band line-up changes followed. The band then decided to release their third full length studio album in 2013, titled "Voices of Eternity". Several guest musicians feature on this album.Giles Lavery, the lead singer of Australian metal band ‘Dragonsclaw’ has taken on lead vocalist duties on all tracks. Youmni, lead singer of Dubai-based metal band ‘Ascendant’, handles backing vocals on all songs as well as lead vocal parts on ‘Burning Bridges’ and ‘Ghost of A Memory’.Vin Nair, lead singer of Dubai-based rock band ‘Vin Sinners’ takes on the part of ‘the Narrator’ on ‘Ghost of a Memory’. Riju “Dr. Hex”, bassist of Mumbai-based metal band “Albatross” handles the bass on ‘Eternal Rites’. You know, when I think about India, the first things that usually spring into mind is their food, their religion, and their love of Bollywood music, so I got quite a surprise when I received a promo from a Heavy Metal band based in India. This did begin to worry me, as India is not really a Heavy Metal music country, so I did have my doubts about this album. So were my doubts justified, or was I worrying for nothing? 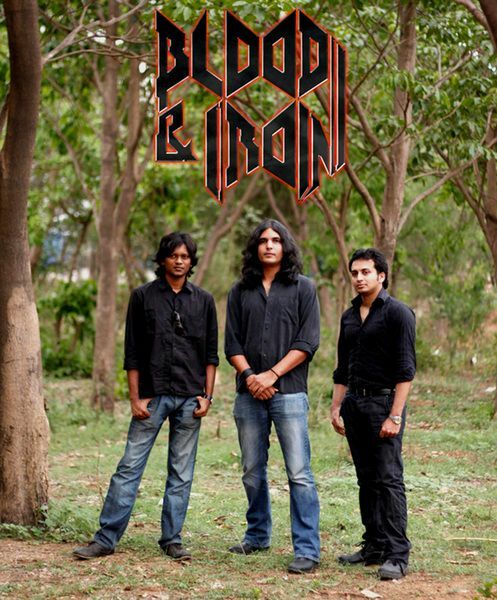 Let us find out.The band in question is called BLOOD & IRON who formed in Bangalore, India in 2005. With three albums under their belt, this new one entitled “Voices of Eternity”, which was released last year in 2013, and will also be released again later this month. This band mainly constitutes of two guitarists and a drummer, but for this, they invited several guest musicians to rock with them on this new album. The guests include Giles Lavery from Australian band DRAGONSCLAW, Youmni from the Dubai band ASCENDANT, Vin Nair who is also from Dubai and plays with VIN SINNERS and lastly Riju “Dr. Hex” from the Mumbai band, ALBATROSS.With each of those special guests filling in the other parts such as vocals, bass, and even some narration parts, it’s clear the band knew they would not be able to do everything themselves, and having musicians from different backgrounds and different continents, can often add the missing piece of the puzzle or the missing ingredient in a band’s sound, especially if it is a Heavy Metal band.I see this happen a lot with bands inviting in people they know to collaborate and perform with them and often it can work out well, but does it here? 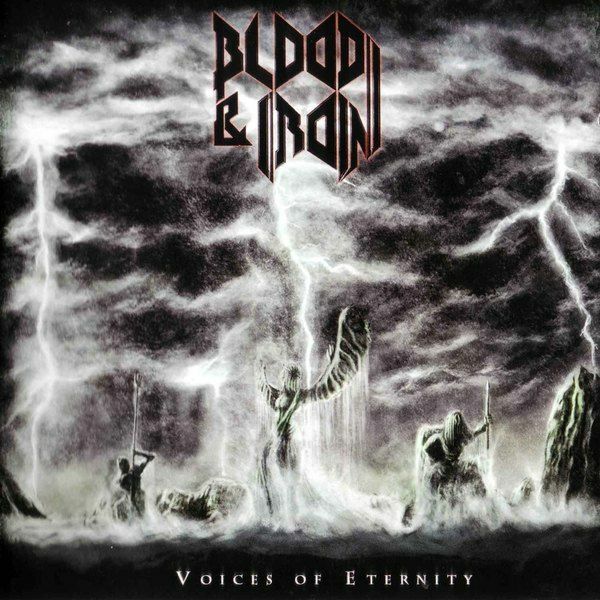 Well, when I first listened to it and heard the first song, I was not expecting it to sound the way it did, as I expected it to sound like Indian music, but here it sounds like a Metal album which is no surprise, as BLOOD & IRON are a Metal band, after all.So what about the music? On the face of it, this sounds very heavy like a Heavy Metal album should, and you can indeed hear the music, and despite a few places where the production could have been a bit better, the performance of the music from the three Indian members in the band is very good and they can indeed shred.As for the vocal performance, the duties are split up between Youmni, who sings lead on two songs, with Giles Lavery handling the rest and with both being singers from two different metal bands, they’re no strangers to singing heavy music and showing what they can do. They do just that here and you do become impressed with the delivery, but there are moments when the performance could have been a bit better and the growling and screeching does spoil it a bit in some places, but overall, despite the minor issues, it’s not bad for what it is, so I can’t nitpick too much.So what do I think overall of the first Indian Heavy Metal album I have heard since becoming a music journalist? Well, all of my opinions have already been explained in the past couple of paragraphs in this review, but I’ll do a quick summary of my overall impressions, which is for something that is from a country who usually specialize in Bollywood music; it’s really not bad at all.When you think about India, you do think about a lot of things, but Heavy Metal is not one of them but. If you listen to BLOOD & IRON, you will learn that even though you’re from a country where you are only known for certain things, you realize that the world is a bigger place then you thought, as there are those who like to do things differently and experiment with something they enjoy.